I know there hasn't been a lot of variety in my posts lately, and frankly, I don't really care. I'm enjoying these Perth Curvettes challenges, and I really want to complete this one. I think it's important that we celebrate our bodies! Today I'm showing off my shoulders. And, I couldn't think of a better way to do that than in a Hell Bunny dress!! As I've mentioned many times before, I've never really had an issue with my arms, and I count shoulders in this too. To me, shoulders are an area of the body I've never really thought about one way or the other. They do their job, they do it well, and I have no issues showing them off. I really love this dress. As I do with all my Hell Bunny dresses! But, this one actually has bunnies on it! Plus, it is perfect for this shoulder challenge as it shows my shoulders in all their glory! Look at them, being shoulders! You also get bonus snaps of Kransky. He just loves having his photo taken!! Want to join in? 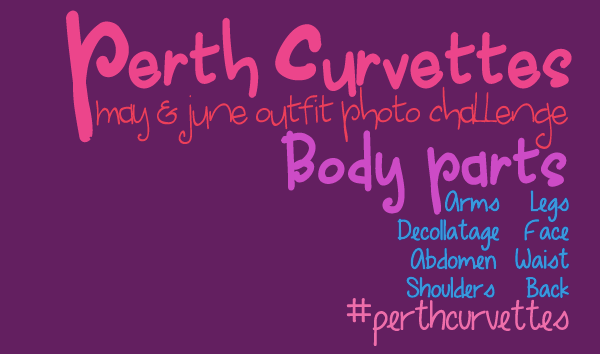 Add your blog to the linky below or use the hashtag perthcurvettes on Instagram! !